See flaming heart on your computer with ‘Heart on Fire’ goodies including: screensaver, wallpapers and a desktop gadget. 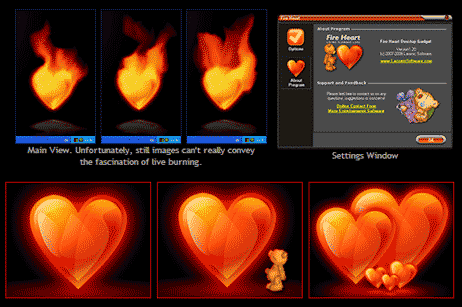 It shows live heart beating while heart shape object burns bright on the desktop. It renders unbelievable realistic and smooth real-time fire effect. Look great, thank you !